Deep in the mountains, there is a little known shack known as the “Hoghunter Hilton”. Few people know about it, even fewer people have been there, but it is a luxurious stay compared to tent camping all week. A solid roof and walls, mean you can sleep in after hunting all night. 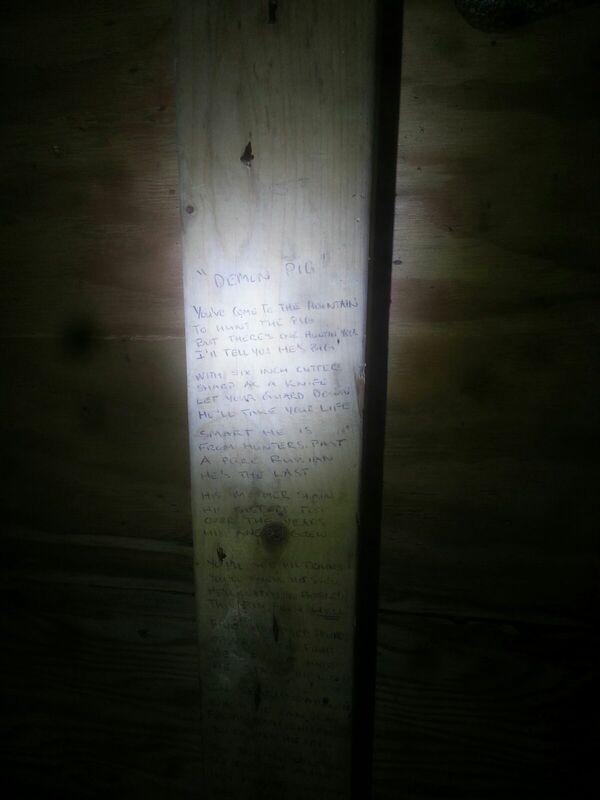 If you hunt out of the shack, it is tradition to sign the wall and the dates go well back into the 90’s. Also inscribed on the wall is the following epic poem shared here for “Humpy” because his season always ends before he can hunt up there. 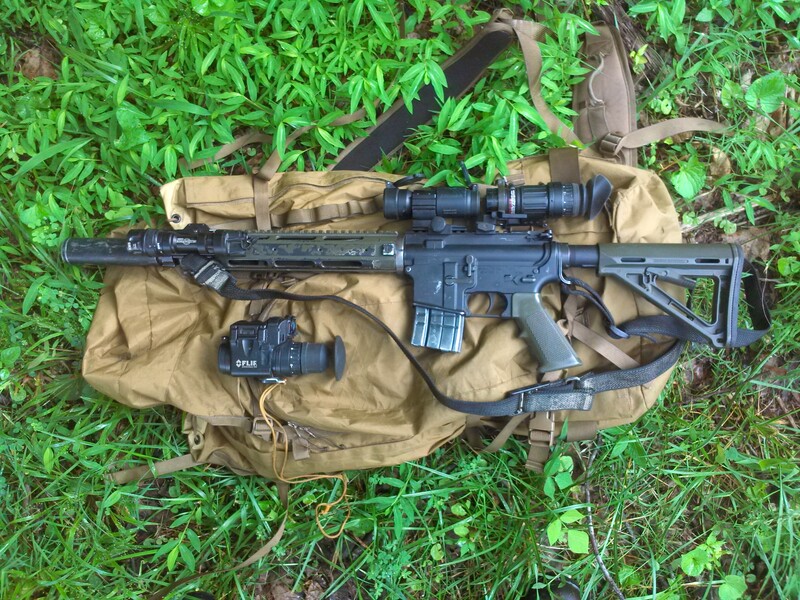 This entry was posted in Campfire Chat and tagged hoghunting on September 12, 2015 by bigpigoutdoors. The other day, I sat down to start my fire for lunch and I gasped in horror when I discovered that the fatwood stick that I have been carrying for 2 years was missing out of the mesh pocket of the Flash 45!! Fatwood is easy to come by in my area, but having started hundreds of meals with this stick, I was a little heart broken. My successful day on the front lines of the War on Swine had taken a sour turn and I cursed the open top mesh pockets of the Flash 45 for my loss and swore to break out Ole Faithful the next day. Well, when I got picked up that afternoon, I found my beloved fatwood stick in the bottom of the pack cabinet on the boat. Relieved, I still decided to switch back to Ole Faithful, my custom built Cold Cold World Valdez pack, for a little while. Back in 2010, I found Cold Cold World packs through an online search of alpine packs. It seemed like a perfect fit when I found out that Randy, the owner of CCW, was willing to customize. I wouldn’t be climbing, so I asked to ditch the ice axe loops, daisy chains, ski slots, and crampon straps. 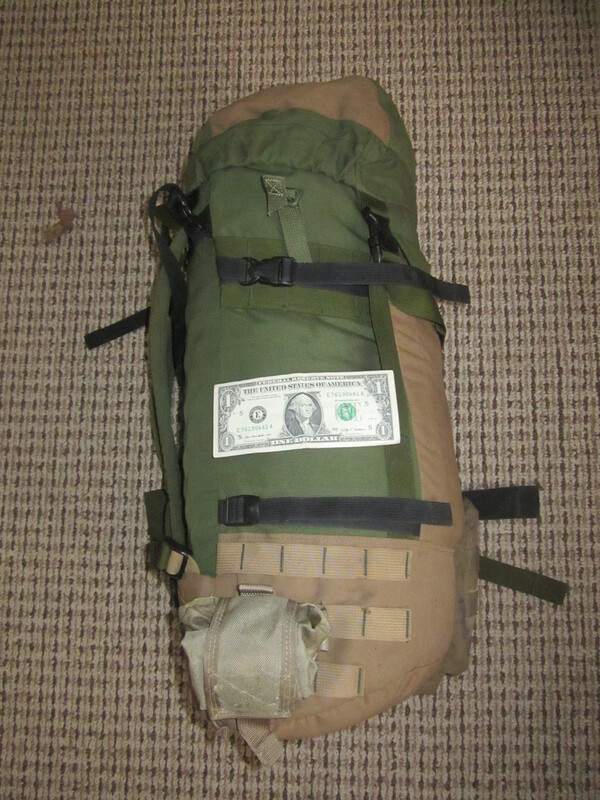 In their place, I added a front pocket for my ticket book, a real hip belt with MOLLE compatible webbing, and MOLLE webbing on the sides, both low and high. 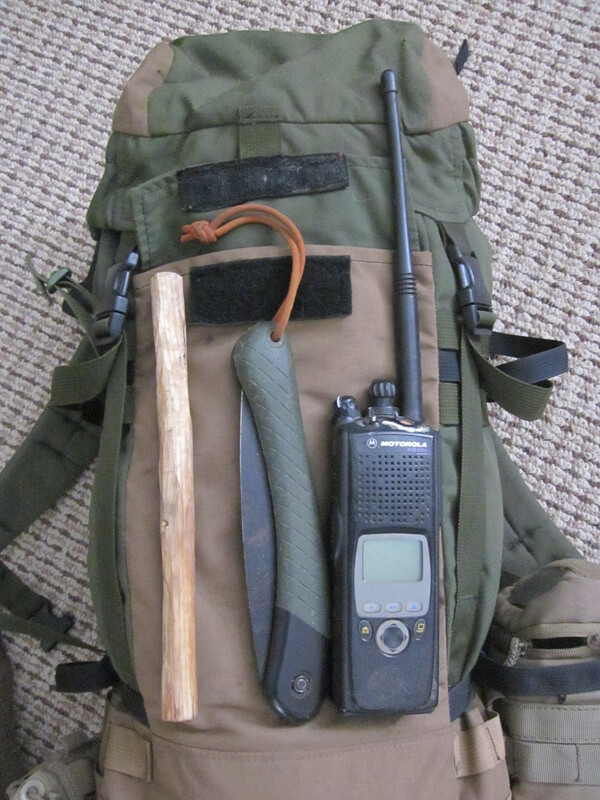 Nowadays the pocket carries my radio, a saw, and my fatwood stick. The webbing holds my water bottle pouch and a roly poly pouch that I usually stuff with tinder, but can add another water bottle if needed. 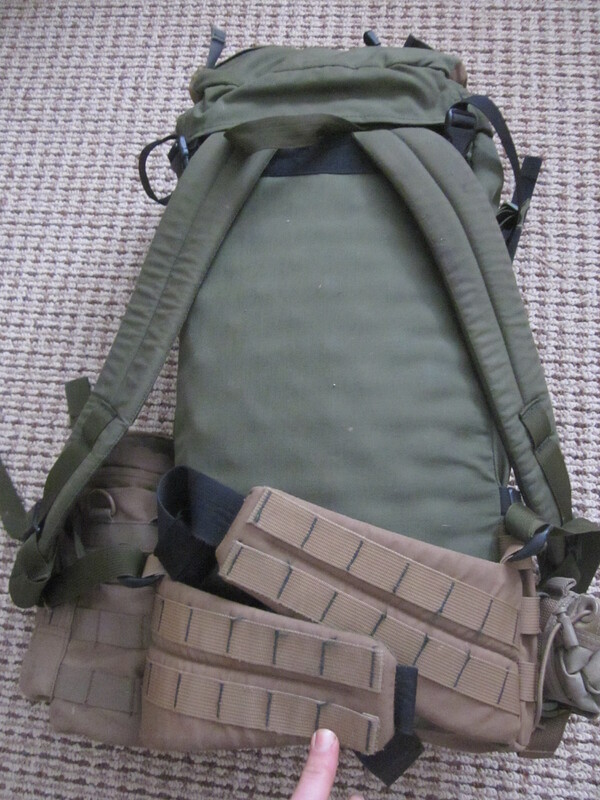 One of my favorite aspects of this pack are the compression straps, seen here compressing two different loads. This, along with the slim profile, allow me to crawl through some hellacious rhododenron and laurel thickets, lovingly referred to as “Rhodo” and “Laurel Hells”. The 500 D Cordura has held up great under the abuse of daily work. The color scheme of coyote and olive drab blends in well, without being overtly camo for family vacations and other travels. 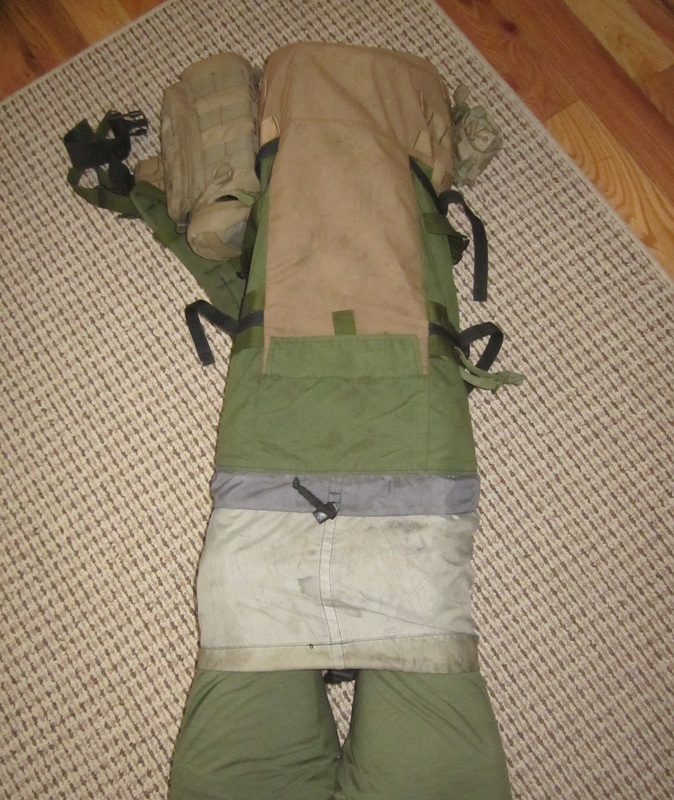 At 2 pounds 4 ounces empty, I stuff a 4 ounce bivy pad in the designated sleeve and still have a lightweight, ultra tough pack that can double as a lower body bivy bag with the storm collar extended and a 3/4 closed cell pad. 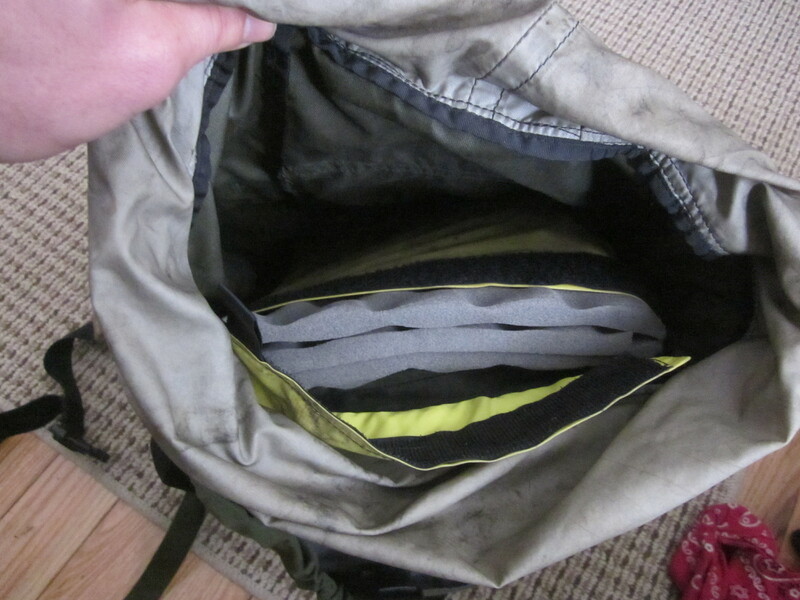 The top lid has two pockets, one on top and one underneath. It is removable and I had two loops sewn on to allow use as a fanny pack if needed. The Valdez is extremely well built and has a few finer touches, like the yellow lining of the pockets for better visibility while searching for contents and the reverse adjustment of the shoulder straps. My only gripe would be that the torso length is a little short for my frame. 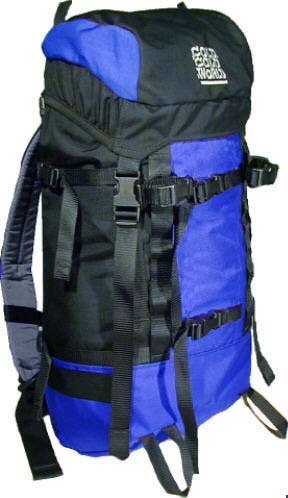 This isn’t by accident, as the pack is designed for climbers wearing a harness. 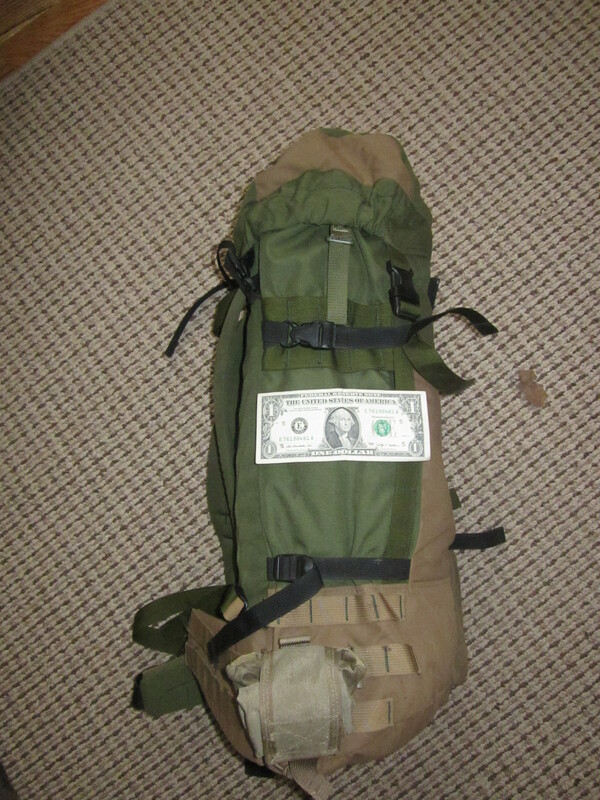 This worked out great when I was wearing a duty belt, but I no longer need that feature since I am only toting a rifle. 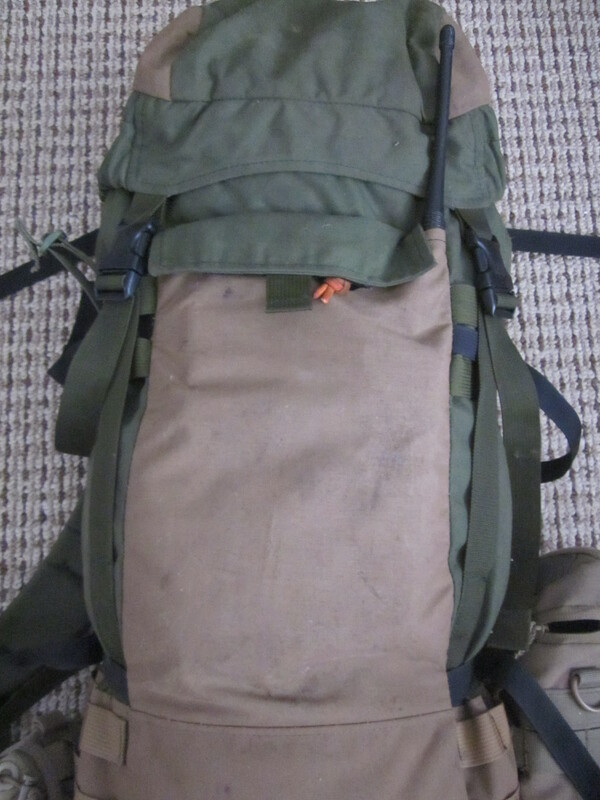 With heavier loads ~ 30 pounds, this means it can be a little heavy on the shoulders, but my typical load is 15 – 20 pounds, and it handles that well. I love this pack so much, that when my wife tried to take it to Florida last month, I gave her my “only one ever built” and “if something happened to it, it couldn’t be replaced” speech. Luckily, she caved under the pressure and took one of my other packs. That story is only partially true. My buddy Jake, a LE Ranger in Yosemite, also had one built after mine. Jake’s pack has seen some cool stuff too and hopefully he will weigh in his experiences in the comment section. In fact when you read this Jake, send me a pic of your pack with El Cap in the background or something else cool. Is the CCW Valdez the “One”? It is pretty damn close for my needs. All I need is some high tech fabric, 10 more liters of space, and some integrated water bottle holders. This entry was posted in Gear and tagged backpack hunting, backpacking, backpacks, cold cold world, hiking, hoghunting, Hunting, valdez on March 21, 2015 by bigpigoutdoors. 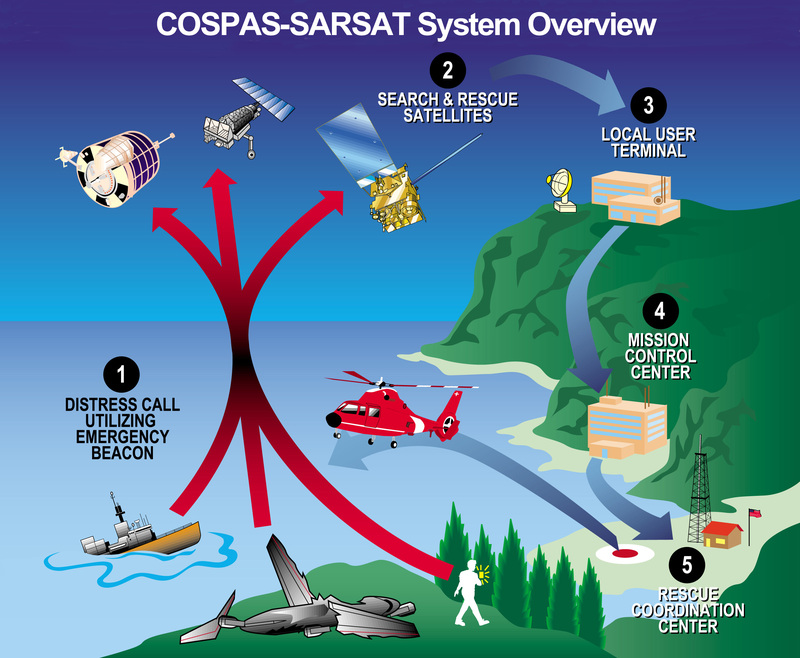 Personal Locator Beacons (PLB), satellite messengers, and cell phones save lives, but have their limitations. They can fail, give erratic signals, and do not guarantee that the rescue teams will be able to get to you in time. 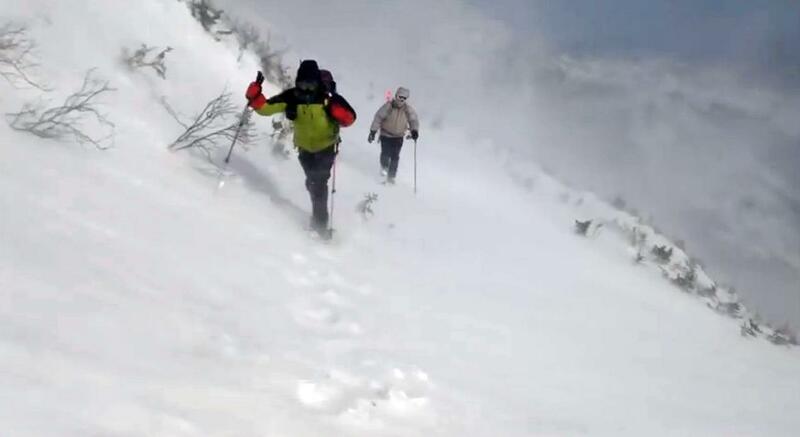 On February 15th, rangers Greg Drum and Beau Bracken began a search for a 68-year-old man from Albuquerque who had departed on January 30th to canoe the remote Lower Canyons portion the Rio Grande Wild and Scenic River. When his permit revealed to rangers that he was overdue, a request for assistance was put in to the U.S. Customs Air and Marine Branch out of Alpine, Texas. 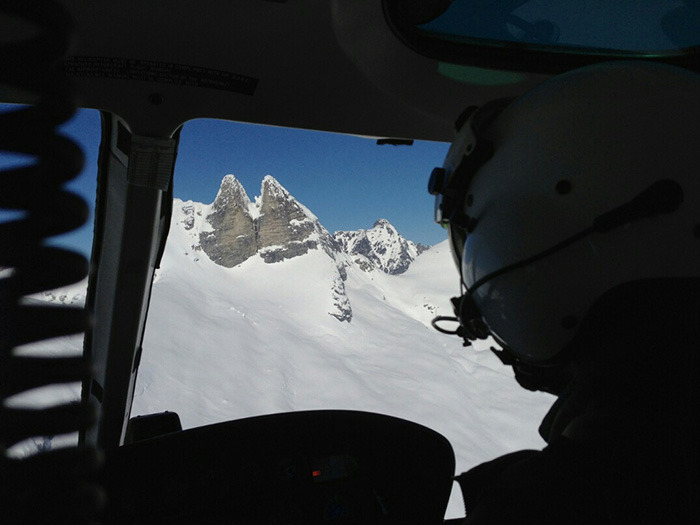 Drum joined the pilot to assist him with the aerial search. The man was spotted on the Mexican side of the river near Upper Madison Falls, a Class III/IV rapid. He’d attempted to portage the rapid, but became stranded due to his physical condition and diminished supplies. He said that he’d flipped his canoe several times earlier in the trip and had lost a bag filled with essential medication. Without his medication, he had begun to succumb to extreme lethargy and was unable to continue his trip. He said he hadn’t seen another human during his entire time on the river and therefore believed his chance of rescue was miniscule. Drum was dropped off nearby and hiked to the man’s location. Using his canoe, Drum helped him back across the Rio Grande. The pilot waited on the Texas shore, then flew him to park headquarters in Panther Junction. He was transported to Big Bend Regional Medical Center, treated there, and released with no lasting injuries. The remote Lower Canyons of the Rio Grande Wild and Scenic are among the most rugged and desolate locations in the Lower 48. Rangers are the only people who patrol the river along this stretch of international border. For more information and photographs of this area, click on the link below. This entry was posted in Search and Rescue, Survival Weekly and tagged ATV, backpacking, boater safety, camping, canoeing, climbing, hiking, hoghunting, ice fishing, mountaineering, White Mountains, wilderness medicine, wilderness survival, wilderness survival stories on February 25, 2015 by bigpigoutdoors. Same routine, except today it rains. I finish my chicken book, make a few calls, draw some plants, eat, and relax. Tonight I am headed to Doe Knob. 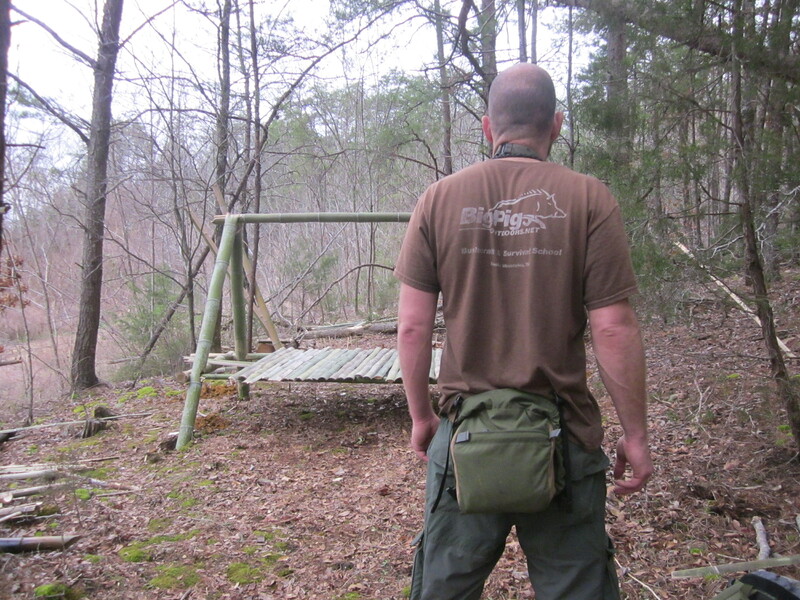 Two weeks ago, while working a problem bear at Birch Springs, I hunted up to Doe Knob. I was stalking a sow and a couple shoats when the wind shifted and I had to back off. Moments later, I watched through the thermal as three coyotes popped up onto the ridge, ran my hogs off, and ruined my hunt. “Hogblocked” by coyotes, I don’t know if I should count them as allies or enemies. 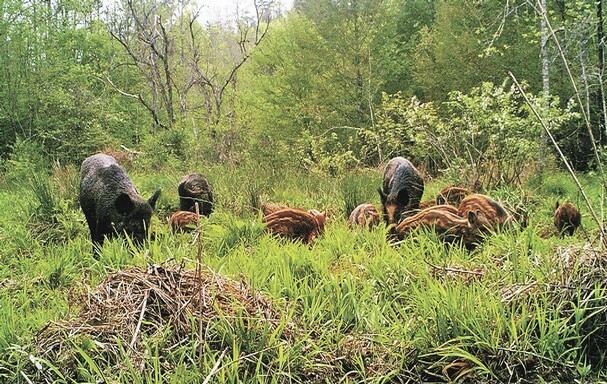 They migrated to the park naturally, so they do not suffer the same fate as the invasive hogs. That night, Doe Knob was theirs, but tonight I am returning to stake my claim. 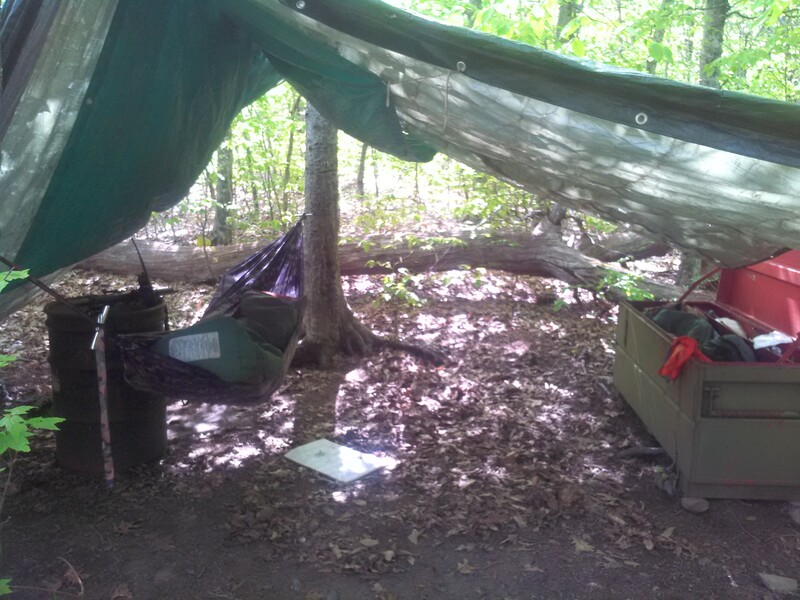 Hunt, fish, trap, and forage. When I created my list of desired activities for when I retired, those rose to the top. Not surprising, as when I am engaged in them, it feels right. Maybe it is the sense of freedom or self-reliance, maybe it is hardwired into my DNA, but I have chosen not to wait twenty years to pursue them. There is nothing natural about leaving meat lay on the ground, but hunting hogs is about as close to the hunter-gatherer lifestyle I can get and still get a paycheck. Maybe one day that will change, but for now I have been hitting a wall of federal restrictions on donating the meat. Foraging in the park is also illegal, with the exception of berries and mushrooms, but I can still look at the menu. As I hunt west I take note of all the edible plants around. 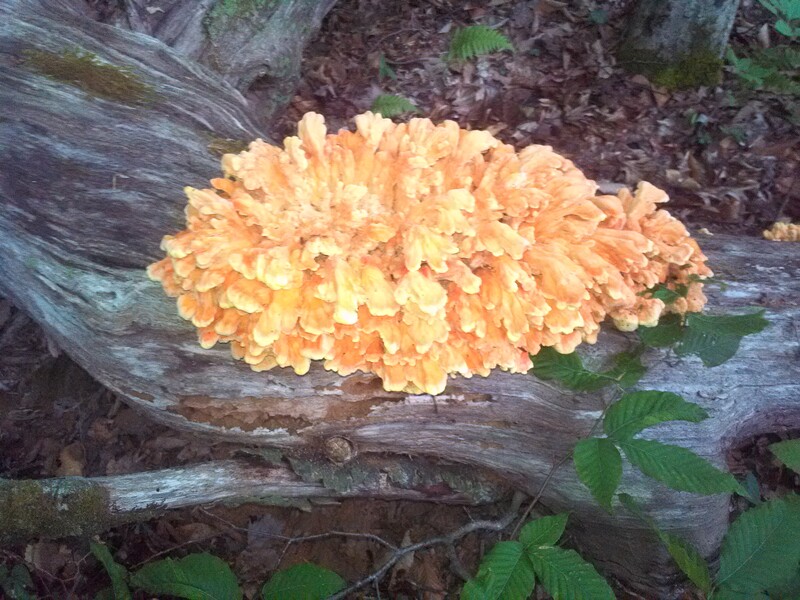 Wild cucumber, carrion flower, spring beauty, trout lily, violets, sheep sorrel, toothwort, branch lettuce, Turk’s Cap Lily, greenbrier tips, chaga mushroom, solomon’s seal, false solomon’s seal, blueberry bushes, beech trees, azalea galls, and a nice big patch of chicken of the woods. About a mile from camp I run into my bear again. He is just down off the hill munching on vegetation, so I slip by him unnoticed, making a mental note for later when I return in the dark. In another two weeks one of my co-workers, “Rambo” Ricky, has to shut down Campsite 13 because of this bad boy. He weighs about 200 now, but later this fall he will be pushing 300. He is the badass on this mountain and knows it. When Rick was camping at 13 to dart him, he said he just rolled in and acted liked he owned it. 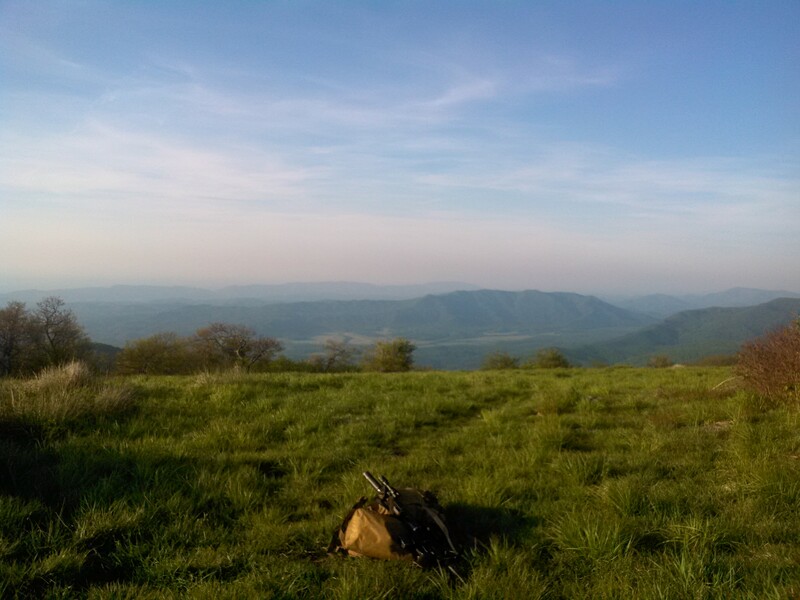 I make it to Doe Knob right before dark, just in time to hear the coyotes start howling. If I could interpret coyote, I am pretty sure they are telling me to get lost and that this is still their turf. Damn. 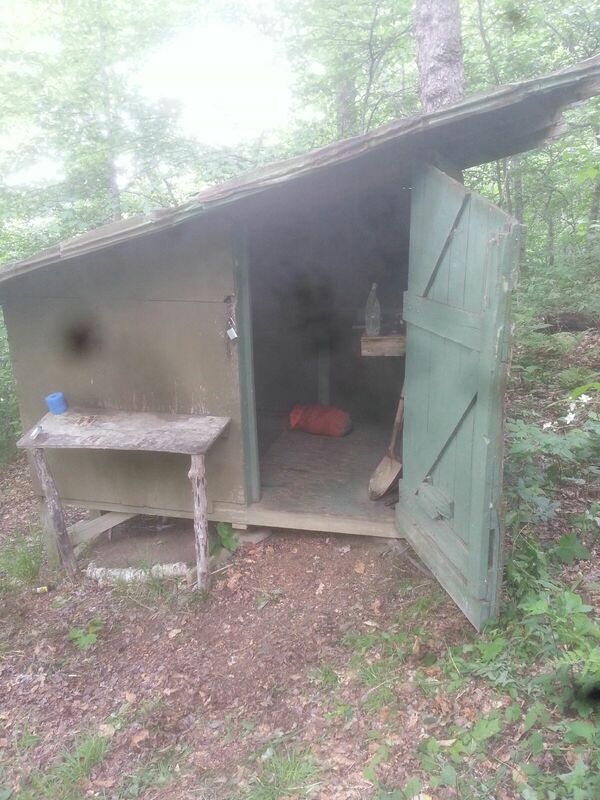 I hunt through mostly old sign and cook my dinner on the back side of the knob. These days I carry a little twig stove that allows me to hike out from camp and set up my kitchen for dinner. 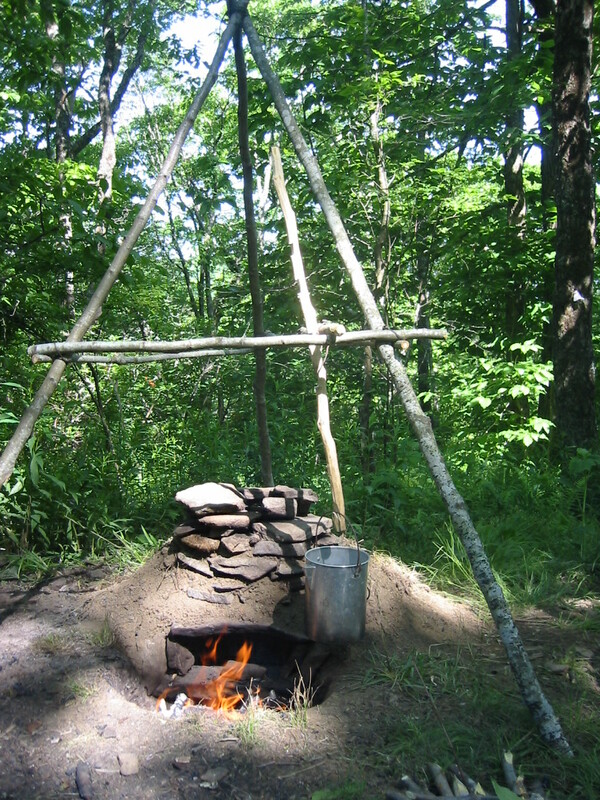 I used to cook my dinner in camp before heading out, but some fool tore down my rock oven that allowed me to bake, boil, and grill, so I cook on trail now. I ate many good meals from this kitchen, even though some Leave-No-Trace fans might object. The truth is, I favor fires and managed correctly, think they are more environmentally friendly. Maybe I leave a fire scar for one season before it fades, but I am pretty sure that the byproducts and industry associated with the production of fancy stoves and fuels are worse and last a whole lot longer. I hunt the two miles back to camp with no sightings of anything but mice. Glowing white hot in the thermal, the mice run up trees, jump, and disappear like watching some paranormal ghost hunting circus. Pictured below are a couple deer seen through thermal to give you an idea how animals look. Adding to our effectiveness, night vision and thermal are also a huge safety boon to a program that once sported tractor lights and motorcycle batteries for the night work. 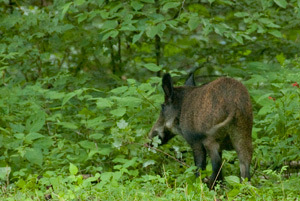 Just before heading down to camp, I see a boar working his way up the hill. It has been windy all week and tonight is no exception, but I have a cross wind that favors me. I rotate the bezel on the Surefire Millenium to the IR mode, allowing me to illuminate the area, when seen through my NVG, but with no visible light for the hog to see. Although I can clearly see the hog in the thermal, the night vision tells me there is a wall of blackberries between us. It’s almost two in the morning and I am on top of a ridge line eight miles from my duty station. 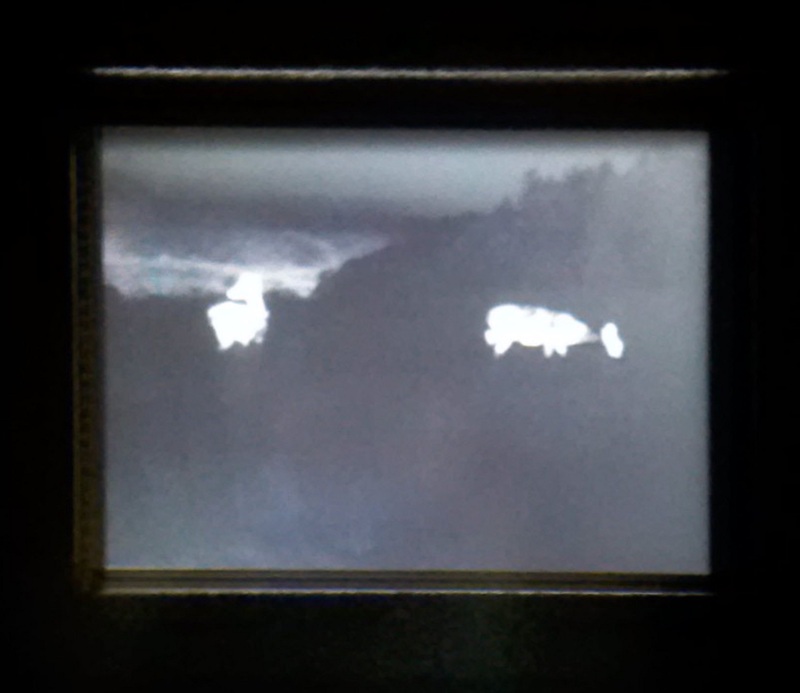 The wild boar that I have been patiently watching through my thermal monocular for the last hour takes another step. I raise my rifle to look through the night vision, but all I see is a wall of vegetation, even though my quarry is less than 30 feet away. The dance continues. After over an hour of watching patiently, he makes the fatal mistake of stepping into an open area. 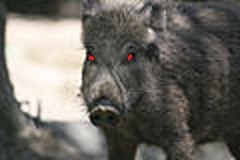 The heart of a hog is further forward than a deer, behind the front legs. A well placed shot to the heart can also break the shoulders preventing any tracking or trailing. I dispatch another 200 pounder and wonder why I hunted the four mile roundtrip out to Doe Knob, only to shoot one 100 yards from camp. 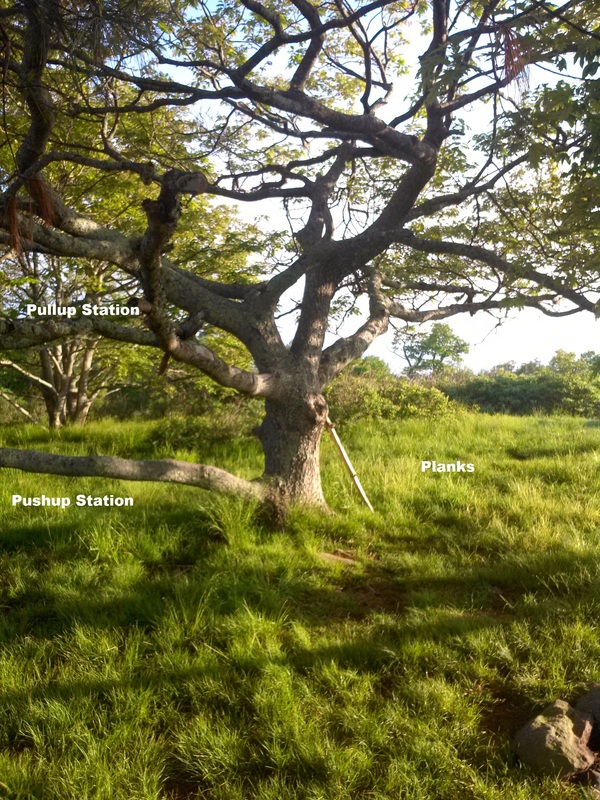 Same routine, but I today visit the gym, a tree on the bald, to do some pullups, elevated pushups, and planks. Fresh air and free membership. Early afternoon, I am visited down at the spring by a father and son camping in the area. Caught off guard by a bearded man drawing wildflowers with an assault rifle strapped to his back, my well rehearsed dialogue, badge, and park service hat assures them that I am not some crazy hillbilly. We make small talk and a couple hours later I see them again when I head to the Bald. I try to call my wife, but my phone is dead. I bought a solar charger for the mountain back in April, but I only get a trickle of juice out of it. Back in the day before I had a cellphone, I could go a week without seeing or talking to anyone. It didn’t bother me, as I am just as comfortable alone or in a group setting, but it is nice to visit with my new neighbors. I eat my dinner on the Bald and chat with Paul and his son Cole about his time with the government, fatherhood, bears, and plants. My table has the best view. Before leaving the Bald, I listen to the weather channel on my radio about the storms headed my way and watch them roll through the mountains north of me. As I head west, the shift in thunder and the wind in my face causes me to hesitate. I don’t wan’t to hike too far from camp. Crossing the bald in a thunderstorm is not something I want to repeat, as I have learned my lesson before. I turn around and head east as the thunder draws near. I make it across the bald and hear a hog in the beeches. I stalk closer, kneel down in the trail, and wait for it to cross the trail. It comes off the bank and stops with it’s head and shoulder behind a eight inch tree, effectively covering it’s vital areas at 25 yards. The thunder is right above me now, so I stand up and lean out to the side to get a shot in as tight behind the shoulder as I can. She crashes through the brush and I hear another one just above me. It grunts, and I see the tops of the beeches ripple as it runs through them. It’s course bypasses the shooting lane I am watching, so I bail off the trail to track the first one down. 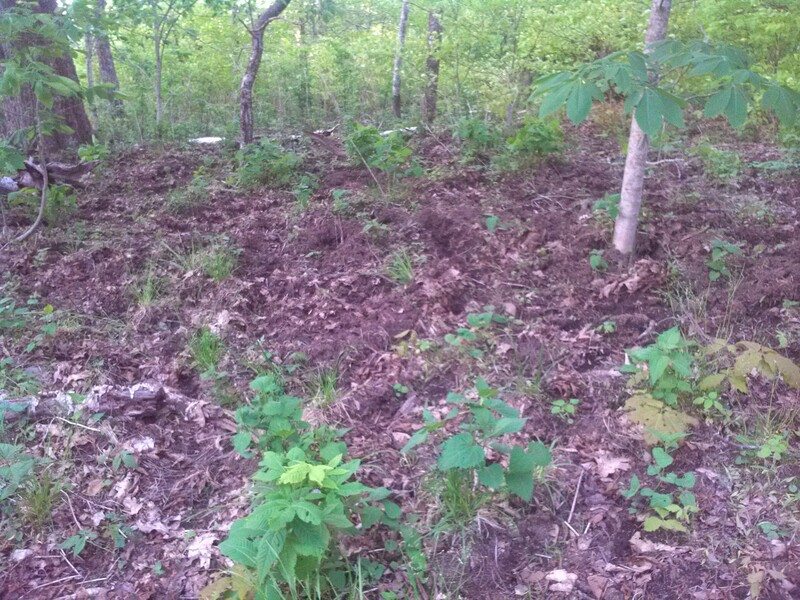 Tracking through acres of hog sign can sometimes be an exercise in frustration. A thick layer of subcutaneous fat can seal up a bullet hole leaving very little blood to trail, so here is some hard won advice. 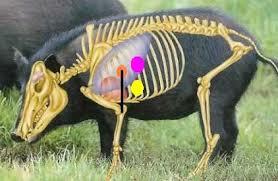 Before you shoot a game animal, take note of exactly where it was standing. Reference a tree, a rock, or something, because if you don’t drop it, you’ll be hunting for that trail. With the threat of rain washing away the blood trail, I don’t waste any time. I pick up a good trail and find her about 80 yards down off the hill. The storm is right above me now. I forgo taking a blood sample and decide to double time it back to camp. As soon as I hit the trail, I run. A half mile isn’t very far, but when you are on top of a mountain in a thunderstorm, it drags out. I make it under the tarp just as the downpour starts. Lightning is cracking off everywhere, so I spend the next hour squatting on a 1′ x 2′ piece of foam. Even though my chances of getting struck by lightning are about the same as winning the lottery, squatting on the foam at least makes me feel like I am doing something to improve my odds. Truth be told, falling limbs and trees are a greater hazard, but there is something about lightning that gets my attention. I ponder the physics of lightning and hammocks, life insurance, and my unborn son, as I wait for the storm to pass. The storm moves on, but commo says another cell is to the west of me, so I stay in camp. My phone has 1% battery life, so I text my wife that I am okay, before calling her to tell her about the storm. With her ubiquitous carefree nature she asks me if “was pretty”. I jokingly reply “Hell no! !” and my phone dies. The rain starts again, so I settle in for the night. I wake up early. I have eaten all my food, so I break camp, collect my blood samples that I stored in the creek, and head out. It is foggy and right before the bald, I see a dark animal to the right. Bears and hogs are both black, and by the time my brain processes that the ears are pointy and not round, the hog has winded me and taken off. I drop down into Campsite 13 and talk with Paul and his boy about the storm. I tell Cole that it was one of the worst I had been through up there and at least he has a pretty good story now. They are breaking camp and heading down the same trail, so I lead the way in case we run into any hogs, which we don’t. I point out a few plants and animal tracks on the way down and enjoy the company. Back at the truck, I head to the station to process my blood samples and fill out some data forms for each hog. The Dragon’s Tail is littered with branches and broken trees, confirming the power of last night’s storm, and while charging my phone, I receive two texts from Thursday afternoon. 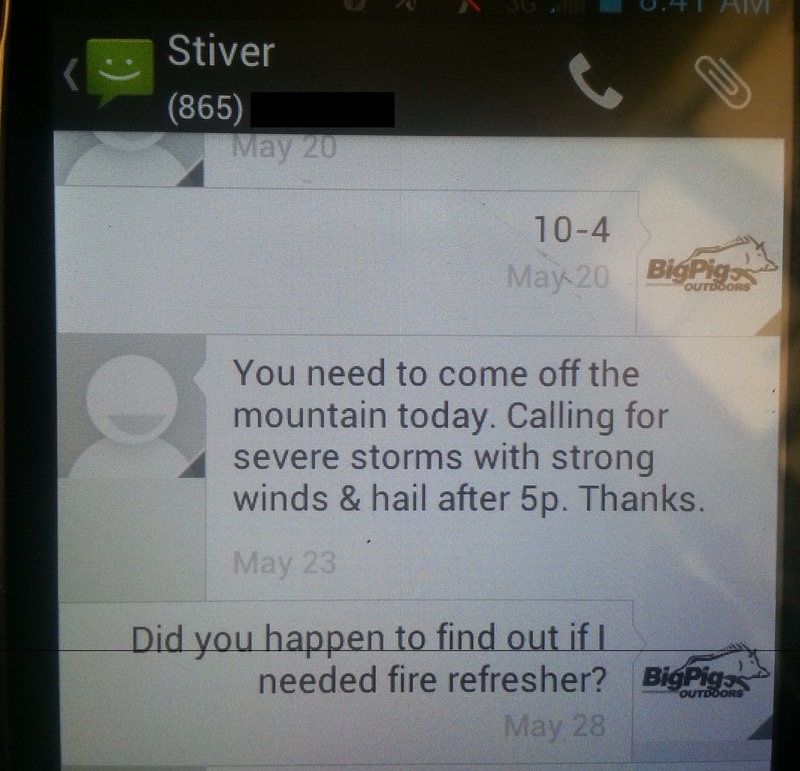 One from my old supervisor asking if I was available to run the boat on a rescue down on Fontana Lake and another one from my current boss that warned me of impending doom. Maybe it is time to start shopping for a new solar charger. My week is done and I reflect upon it as I head to the house. 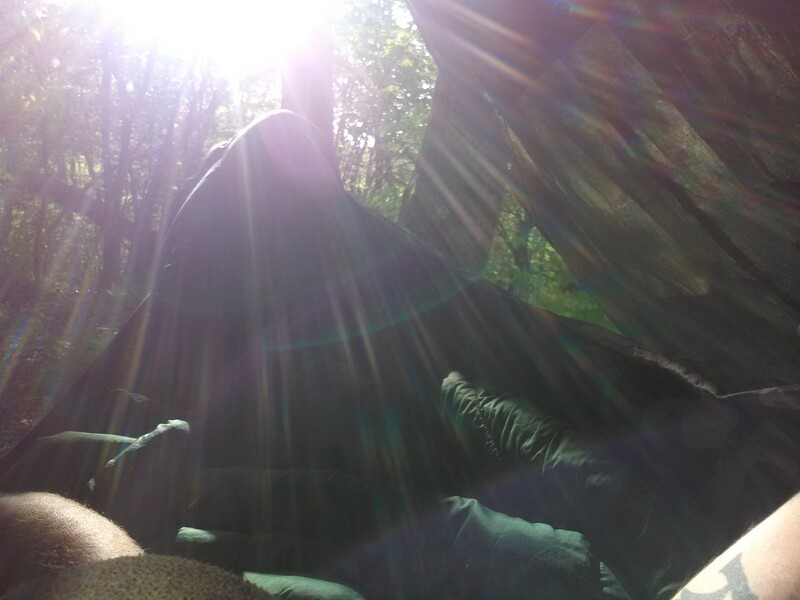 It may be hard for readers of this blog to believe, but we have had guys quit our crew because they hated camping on the mountain. I even know of one case where a hunter pretended he was up high by calling in and out of service from the station. The “mountain” is not for everyone, but for me it is a good fit. This entry was posted in Hunting and tagged bears, coyotes, deer, Doe Knob, foraging, Great Smoky Mountain National Park, Gregory Bald, hiking, hoghunting, Hunting, lightning, night vision, Smokies, Surefire, thermal, thunderstorm, wildlife ranger on July 2, 2014 by bigpigoutdoors. That is what my dinner conversations revolved around in my mid-twenties. Nowadays, “Girls” have been replaced by “Wives”, but camo and hoghunting are still holding strong. Here is where I work, 500,000 acres of beautiful wilderness. Average winter lows are in the mid-twenties and highs can be in the 50’s. The wind on the lake makes it one of the coldest places to work in the park. Rain, sleet, and snow, we get it all, and it is a constant layer shuffle throughout the day. When you hike for a living, weight starts to be a factor. 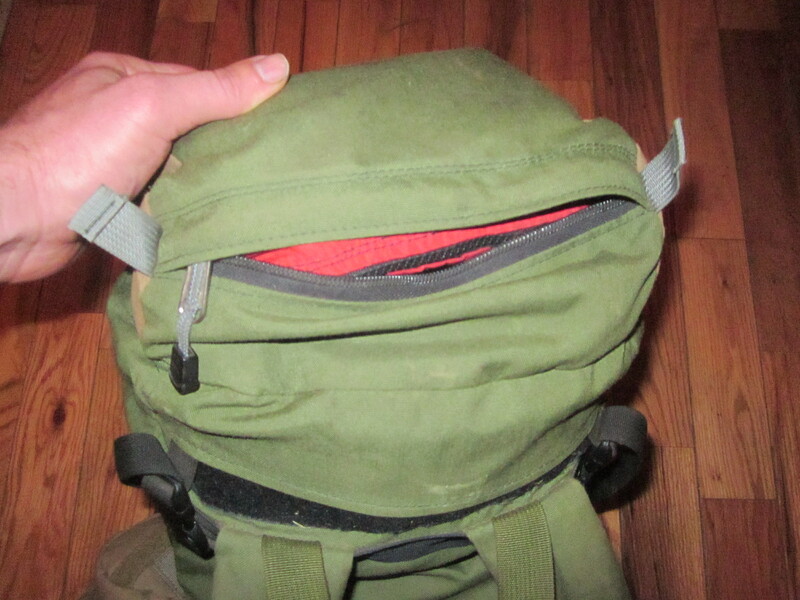 Every ounce counts and my daypack that can keep me out overnight in 30 degree weather, runs around 13 lbs. I will post my pack contents soon, but tonight it is another camo jacket discussion, right Danno? Why does all this matter to you? Because your clothing is one of THE most important survival tools you carry. With a good jacket that can keep your body warm and dry, you can make it through a cold night if forced to stay out. If you are injured, build a shelter and fire may not be an option, so your clothing is what will keep you alive. I know guys that balk at me spending $170 on a jacket, but will drop over $100 on a knife or a grand on a rifle. In an email correspondence, a WT rep said they are working on blaze orange as an outer shell option. If you are not a hunter, the WT jackets are available in other colors as well. My original jacket was the Columbia Gallatin Range wool one, weighing in at 2 lbs. 14 oz. 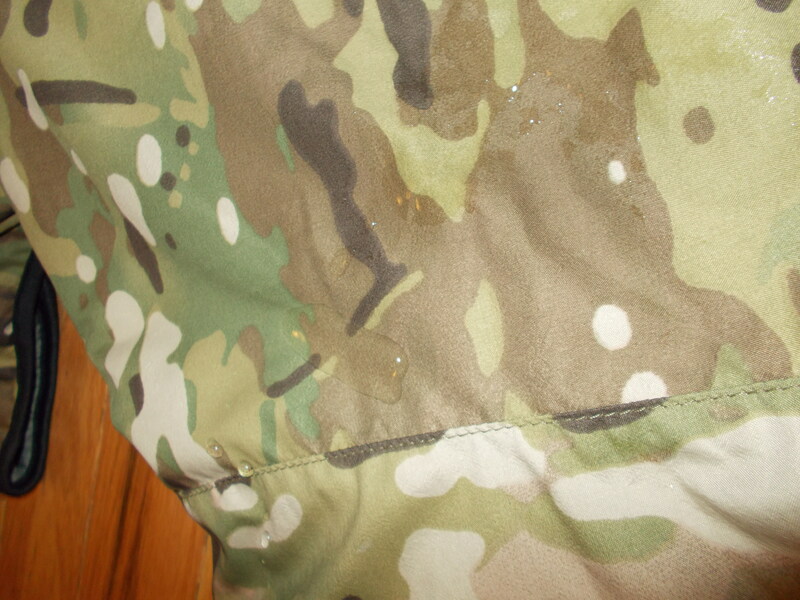 It is heavy, not water repellent, soaks up snow, and had cotton lining in the hood which I cut out. I am a fan of wool, but not as my outer layer anymore. I find it heavy, and even heavier when it gets wet. Wool is great around a campfire, but I have managed not to burn myself up wearing the other jackets. The Wild Things Gear primaloft sweater was a big improvement, weighing in at 1 lb. 6 oz. Used as a insulating layer, it works great, but as a stand alone outer jacket, it lacks a water repellent coating and is quilted. Quilting can allow moisture to enter and your warm air to exit. 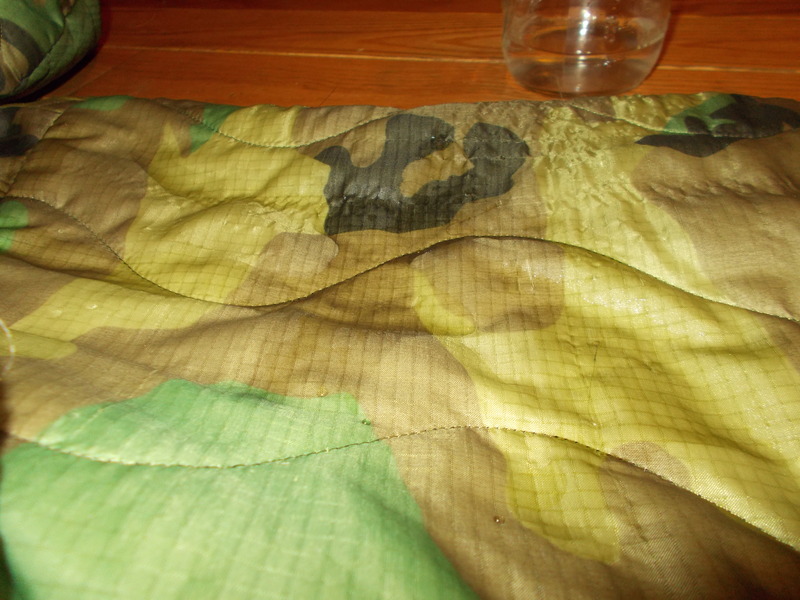 Here you can see water soaking in and the quilting. 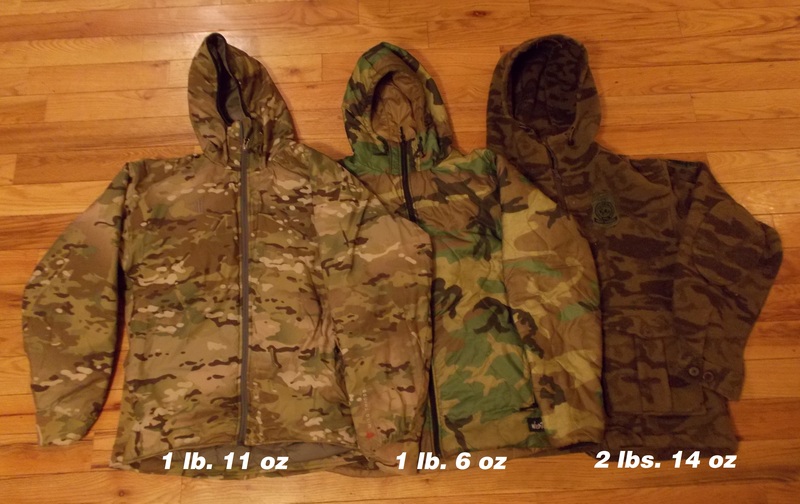 My new jacket is the Wild Things Gear multicam Insulight jacket, weighing 1 lb. 11 oz. 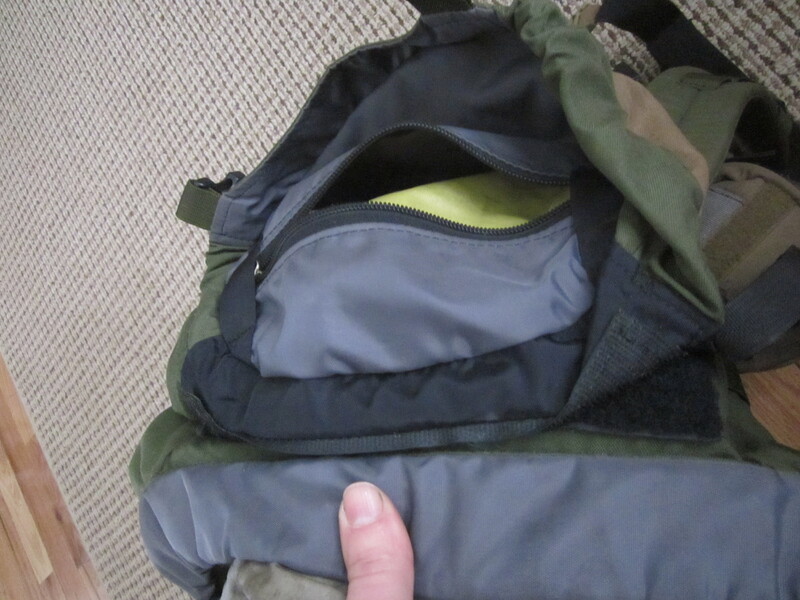 Like the primaloft sweater, it has 4 ounces of Primaloft One. Unlike the sweater, it’s exterior is not quilted and has a DWR coating, which you can see below. I carry a rain jacket in my pack, but this will get me through a light rain and keep snow from sticking to me. Fleece lined pockets, a great hood, and a mesh interior pocket keep it simple, but effective. Why not down? It is light and warm, but down compresses when wet and loses much of it’s insulating properties. I have not tried the DriDown yet. Another downside would come from all the briars ripping at me on a daily basis. 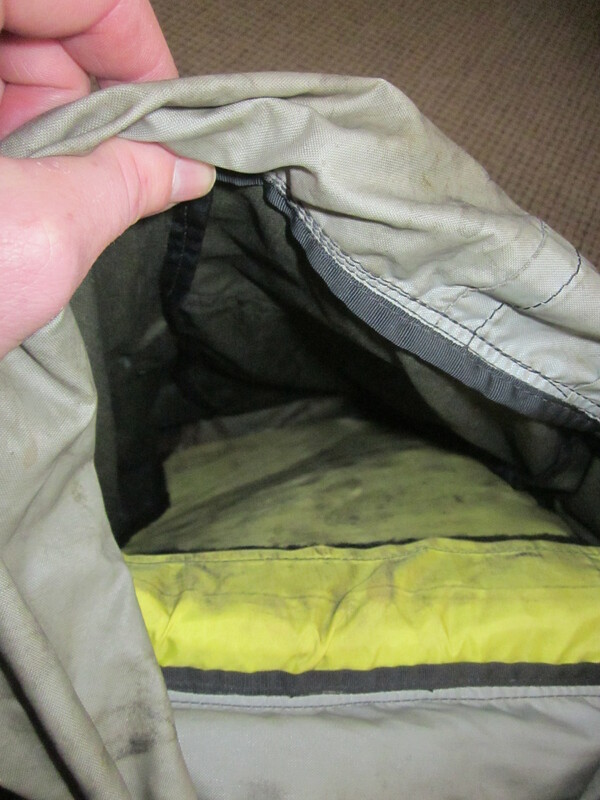 I have another WT jacket that got ripped, but the insulation is still in place. 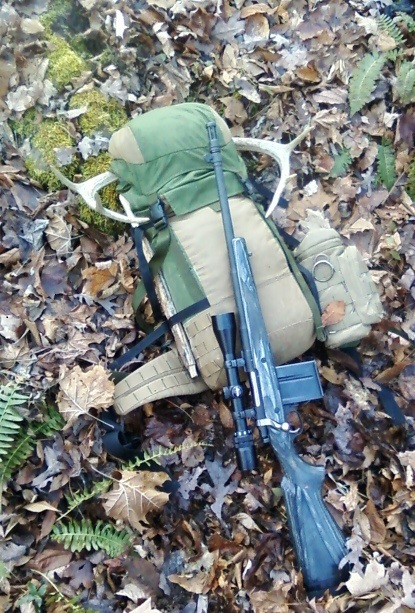 This entry was posted in Gear, Hunting and tagged backpacking, Clothing, columbia gallatin range, hoghunting, Hunting jacket, Jacket, multicam, Wild Things Gear, Wool on January 1, 2014 by bigpigoutdoors. Those were the four words I wrote down on my resignation form yesterday. My boss quoted the form “Please be specific and avoid generalizations”..
You see, I signed up to be a Protection Ranger in the Twentymile District of North Carolina, the remotest section of the Great Smoky Mountains National Park. 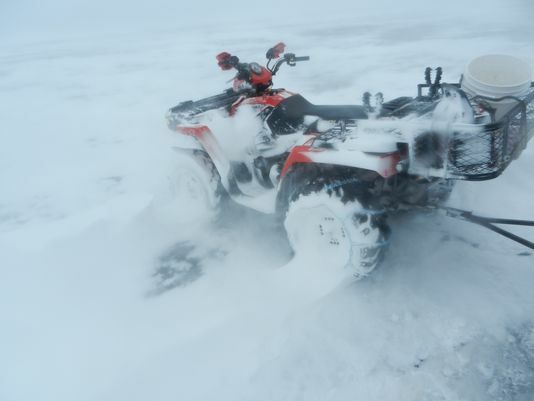 With no road patrol and no frontcountry campground it was a backcountry ranger’s ideal situation. 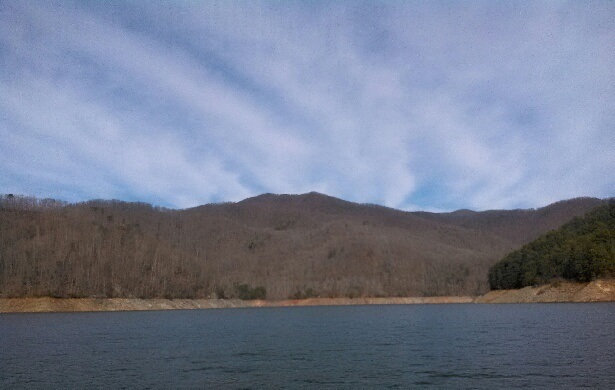 Lots of poachers to chase, the beautiful Fontana Lake, and 132,000 acres of wilderness that I had roamed in my hoghunting days excited me to the core. Life was good, but change, like the seasons, is inevitable. With sequestration, under staffing, and more budget cuts on the way, the “least” visited section of the park is not a priority on the managerial list. I could see the writing on the wall, or really the lack of it on the board. Arriving early for a meeting at headquarters one day, I saw on the dry erase board, an exercise for projected minimal staffing. There was no Twentymile. At times this summer I was only working one day a week in my district. They articulated the need, but when I signed up for my job I didn’t have dreams of sneaking around campgrounds looking for dope smokers, babysitting tubers, or typing report after report. My heart yearned for the woods on a cellular level. Maybe it was during my Fur-“fish & game” -lough, when I couldn’t even sleep indoors because the sense of freedom was so overwhelming. Maybe it was the paradigm shift that occurred during forty five episodes of Peace Revolution podcast on my commute to another district. Maybe the realization that 25 years of my life is not worth a pension of $1200 a month. 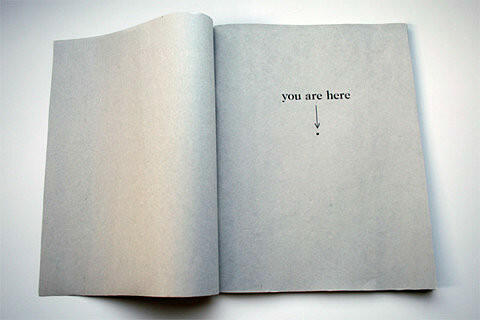 Or maybe, It could be the fact that where I am heading there is no “box” to contain my creative ideas. Weekends and holidays off, growing a beard, no more stinking reports… maybe it is all of it. On Saturday I had received my 10 year service award and on Thursday in four short words I had given up a career and the permanent status so many of us feds chase. “You sure?” asked my boss. Resource and visitor protection is the division I worked for, but my mission really won’t change much. Being able to focus on building my school and the curriculum will do just that. People only protect what they value, and people only value what they can experience or find useful. Fear or lack of knowledge hold a lot of people back from connecting and becoming part of nature. Both of those are easily remedied by education. For the next six months, I will also return to my old hoghunting job, roaming the mountains in the district I love. Stalking the woods with a suppressed 6.8 again makes me smile. 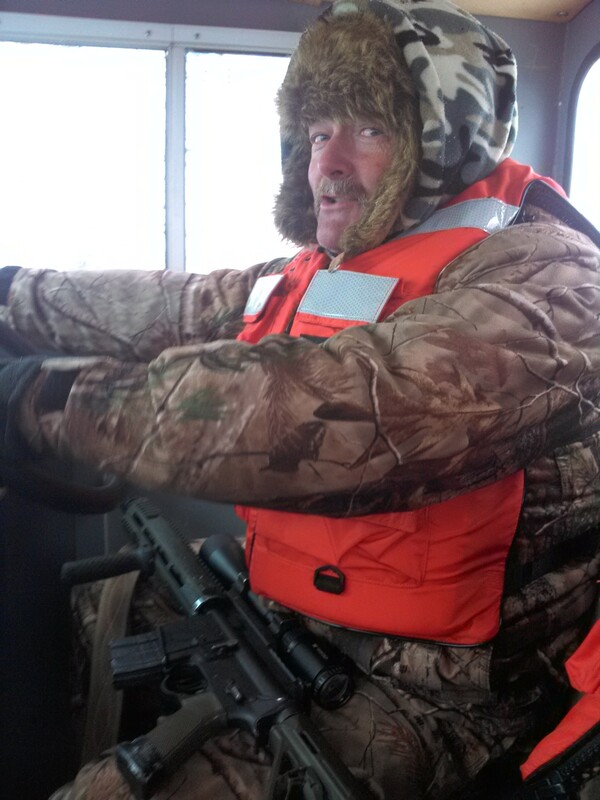 I will still keep my eye out for poachers and if they need me for a carryout or SAR, I will be around. You gotta love the Fresh Prince, he does have a way with words.. 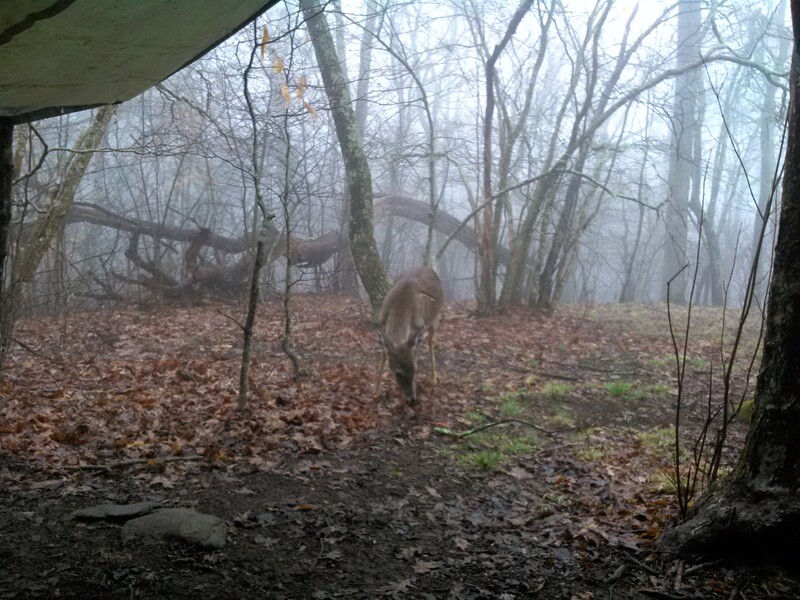 This entry was posted in Campfire Chat and tagged Great Smoky Mountains, hoghunting, park rangers, Peace Revolution, the Matrix, Will Smith on November 9, 2013 by bigpigoutdoors.